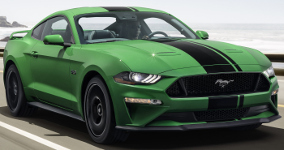 The 2019 Mustang GT comes with the 460hp, 5.0L V8, dual exhaust with quad tips, LED fog lamps, Track Apps and SYNC, 18 inch machine-face aluminum wheels with high gloss ebony painted pockets, 6-speed manual with rev matching, and upgraded brakes to name a few over the baselevel Mustang. Options include leather seats and upgraded stereo system. Check out this 2019 Mustang GT Premium in Ruby Red metallic tinted clearcoat exterior paint.